Igor Bulatovsky (b. 1971 in Leningrad), poet, author of seven books of poems, and participant in the New Storage Room literary project. A translator from French and Yiddish, Bulatovsky has rendered prose and poetry by Itzik Manger, Abraham Sutzkever, and Israel Joshua Singer into Russian. He has compiled a three-volume edition of Joseph Brodsky’s poems (2016) and a two-volume edition of the poems of Paul Verlaine (2014). 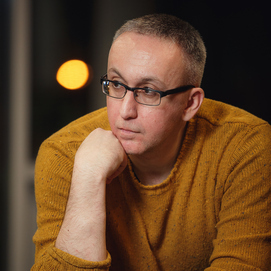 In 2005 Igor Bulatovsky was awarded Hubert Burda Prize for Young Eastern European Poets, and in 2010 he was short listed for the Andrey Bely Award. He works at the Ivan Limbakh Publishing House in St Petersburg.